Enjoy the Abbey’s excellent retreat conditions. The chance to do long meditation retreat is rare. 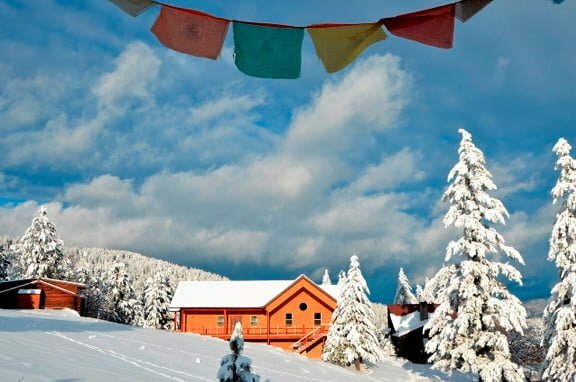 If you’re ready for it, join us for a month-long silent winter retreat. 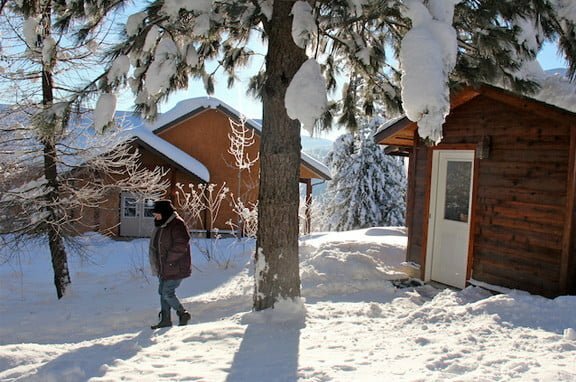 The annual Winter Retreat is a group meditation retreat. We focus on a different practice every year. 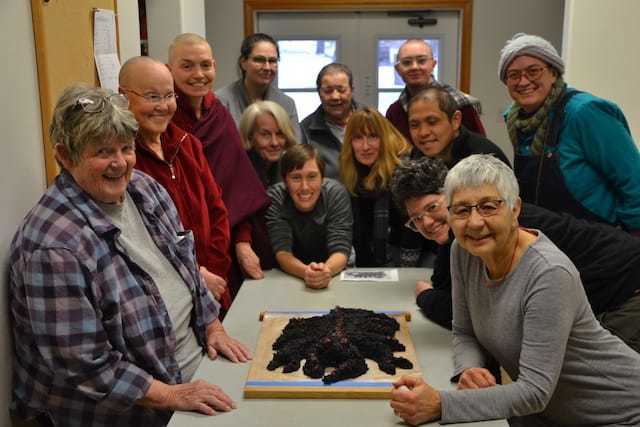 The next Winter Retreat will focus on the Vajrasattva purification practice, December 27-March 25, 2019. There is also a one-month option. Everyone meditates together, doing the same practice, for at least five sessions a day. At the beginning some sessions may be led, but soon everyone practices on their own in silence. We keep noble silence in the break times. However, the group meets periodically for check-ins and Q & A. Everyone shares in daily offering service tasks to maintain the retreat environment. This may include cleaning the kitchen and other buildings and assisting with meals. Snow-shoveling is a common activity for those who are able. Ven. Thubten Chodron offers teachings twice a week or more. She is available for spiritual guidance as needed. Otherwise the retreat is managed by resident monastics. We offer a beautiful retreat environment—peaceful setting, disciplined retreat structure, qualified spiritual guidance, and a supportive practice community. Visit the Abbey —here you will find information on accommodation, food, and clothing. Resources for retreat preparation will be posted here. Retreat plans should be finalized by mid-summer 2019. Commit to living within the 5 lay precepts plus celibacy (refraining from killing, stealing, sexual activity, lying, and intoxicants) during the retreat. Commit to attend all sessions, pujas, and discussions unless you are sick. What is the daily winter retreat schedule? The daily schedule typically includes four or five group meditation sessions of 75-90 minutes, and one individual study session. The first session begins at 5.30 am, and the last session ends at 8:15pm or 8:30pm. Retreatants are expected to attend every meditation session unless they are sick. There is time between sessions for reading, walking, yoga, or other activities to keep the body supple for extended sitting. Everyone shares in daily offering service tasks to maintain the retreat environment. We serve three meals daily, except on new and full moon days when we take the eight Mahayana Precepts together. Like all Abbey programs, the retreat is offered on a donations basis (dana). We invite aspiring retreatants to join in creating the resources to make the retreat happen. By making offerings, everyone works together to create the conditions for retreat. Your offering sponsors fellow meditators. 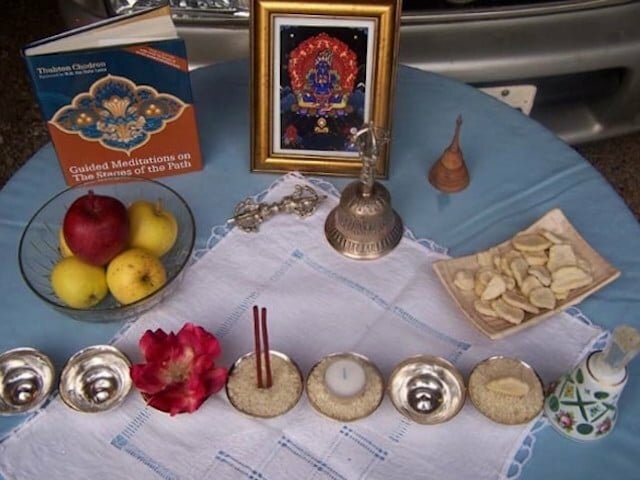 Making your offering also creates merit, which is essential for overcoming any obstacles to doing retreat. Each participant should raise or contribute at least USD 924 for the one-month retreat. There will be an opportunity to offer additional dana for teachings if you wish at the end of the retreat if you wish. For the three-month retreat, please raise or contribute USD $2,772. There will also be an opportunity to offer additional dana for teachings at the end of the retreat. Upon notification that your application has been accepted, please offer at least half of the dana to secure your place in the retreat. The remainder should be offered two weeks before the start date. Learn more about the Abbey’s economy of generosity. Complete the application form and send it to our office. Even if you still have doubts, this is the first step. Half of the retreat donation is due upon acceptance of your application. The remaining donation is due two weeks before the start date. Your participation in gathering the dana to support the retreat shows that you are serious about doing retreat. You can make a check payable to Sravasti Abbey, indicating Winter Retreat on the memo line, and mail it to: Sravasti Abbey, PO Box 447, Newport, WA 99156. Sending the donation by credit card is fine, but please add 3.3% to offset bank processing fees. Indicate Winter Retreat in the comments box. If family or friends send offerings on your behalf, please email our office to let us know that they are supporting you in gathering donations for the retreat. Can I retreat for more or less than one month? No. The Abbey is closed to the public for the three months of Winter Retreat. We ask that one-month retreat participants arrive before the start date, and leave together on the last day. There will be no early departures except in case of emergency. Read the Visit section for information on transportation and what to expect at the Abbey. Go to the Event Schedule for this year’s Winter Retreat dates. After retreat, you can continue with the your practice from home through the Retreat From Afar. Can I attend the retreat with my partner? We have found that it is best if couples do not attend the Winter Retreat together. This gives you the space to retreat from attachments and really focus your attention on your own practice. Can I come just to offer service? Some people love serving retreats, and doing so brings lots of reward and merit. We especially welcome cooks during our retreat time. Offering service attendance is by application. We prefer people who serve the retreat to have retreat experience. Complete and send in the registration form, telling us what you would like to do. The Abbey office will get in touch with you. Can I be in touch with my family? We keep the retreat discipline strictly to give meditators the best possible conditions to work with your minds. For that reason, we curtail all contact with the outside world. That means no incoming or outgoing phone calls, text messages, emails, or letters are permitted. Retreatants should make all necessary arrangements before the retreat begins. In case of an emergency, your family can phone the Abbey. Telephones and messages are monitored regularly, so they will be able to get in touch with you if it’s necessary. Enjoy a supportive group retreat environment for intermediate and advanced meditators.